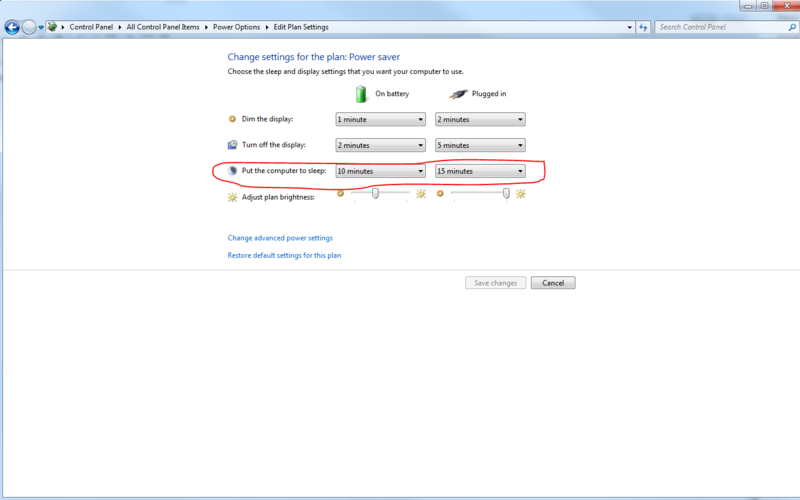 Here’s a quick tip on setting up a PC with any of the instruments a that collects data over night. 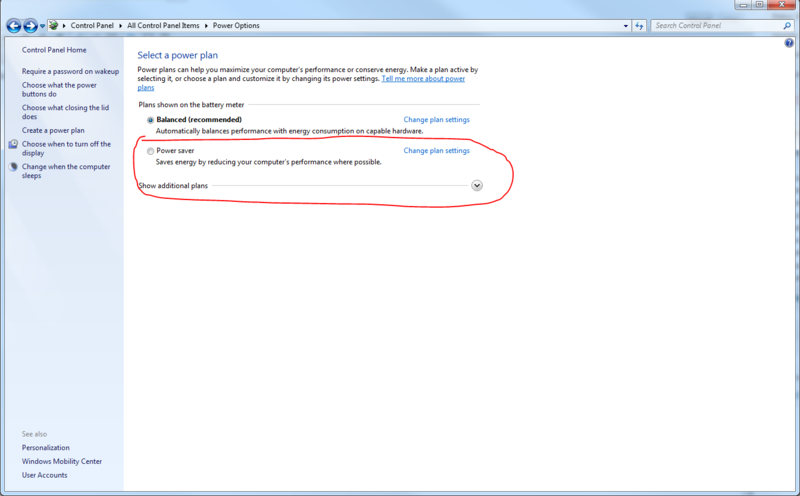 Though here I’m Showing my laptop settings, the PC has the same settings style. Make sure you set the PUT COMPUTER TO SLEEP option to NEVER. By doing this it keeps the hard disks spinning and the communication boards and services up an running. If you don’t then the system will stop acquiring because the PC decided to take a nap after you stopped playing with it for the time period that is set. It doesn’t have anything to do with the system acquiring data as an activity. It’s all about when you last touched the PC. Moving the mouse or typing on the keyboard. So we’ll keep the lights on for you, just help us pay the bill. Many times, messages come through asking for help that say, ” I have an error.” The problem is, to fix something we need to reproduce the error or see what the error says. If you get an Unhandled Excection error, Windows is telling you the application is in a bad state. Here basically you have two choices. Close the application “Do this, Please” or Continue, not recommended because the system will be running in an unknown state. Before, you do either of these, please click on the details button. This will open up a text dialog below the error message, which contains valuable information on what files internally or externally to the application are being effected by the error. Please copy this text and email it or post it someplace where the person rendering you assistance can get to it. 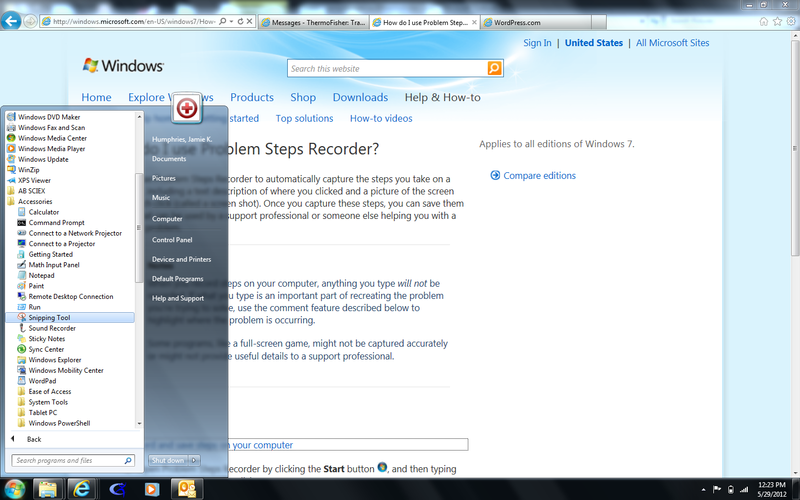 Also, a good tool to use if the problem is reproducable, is a Free tool in Windows called the Problem Step Recorder. See the Link Below for how to use the Problem Step Recorder. And there is always the Windows 7 Snippet tool for capturing images off your screen and saves them in picture format. So help us help you, by using these tools to get us info to pinpoint your issue as rapidly as possible. Multiplexing methods: Bigger is definitely not better. And you’re using an Aria multiplexing front end. Then most likely the mass spec portion of your method file has an acquire time larger than the data window in the Aria portion of your method. This could cause the raw files to remain open and use up RAM depending on your batch size you could run out of memory depending on what version you are using. RULE OF THUMB: The mass spec acquisition time must be EQUAL TO OR LESS THAN, the Duration time in the Aria method. So if the duration time is 3.0 minutes then make your mass spec time 2.99. So, you can definitely do more with less. If you want you Reports to fly off the printer, Give them WINGS! Why don’t my reports print on the fly? Well, one reason could be the printer is out of paper. Most likely,the reason is that your reports aren’t configured. So, in the batch template make sure you select any reports and the type you want to be produced. If you selected reports in the master method then they should be marked accordingly here. If you didn’t then this is your opportunity to fix that step. REMEMBER: Just because you selected reports in either of these places doesn’t mean reports will be created on the fly. When you submit the batch there is a checkbox that says “Reporting”. This must be checked to have reports automatically be produced. So, the feathers are the selected reports and the lift is the checkbox. Have both, you’re an Eagle. If you don’t, your Icarus. One of the issues that many new users have is making sure all the different pieces of software are compatible with each other. TraceFinder installers guarantee the system has the right Foundation, Xcalibur and TF versions. In the release notes on the installation disks, we list the appropriate instrument drivers for that particular TraceFinder release version. An example of this would be an incompatible mass spec driver, with all the other pieces being correctly paired. The instruments may not respond,or the instrument editor may not open because it can not detect the instrument. So a word to the wise always make sure that if you’re taking TraceFinder out for a spin, you bring along the designated driver. One of the Frequently Asked Questions, of almost every week is how can I make TF or any of our Apps run Faster. RAID!!! Now, as a chemist I had no idea of what this was, but I soon found out. This is a function that’s built into the PCs that ship with all our instruments. This is allows data to be written across multiple drives and then accessed from those multiple drives. Thereby speeding up the read/write processing to the data. Now having a 4 drive system does not buy you 4 times the speed. But, most likely you can get 3x out of the system. Also using high speed drives such as the Western Digital RAPTOR drives that have a spin rate of 10,000RPM will increase your data access. Most of the time I’ve seen a 20% decrease in processing time. Dependent on file size. RAID Zero is the fastest but most definitely the risk is higher. There is not backup redundant disk. RAID 10 is still fast but it does give you the safety of making a backup copy of each disk so if one fails you can still recover the data. So if you don’t do a backup of data regularly RAID 10 is most likely the best way to go.